Last week, I wrote a post about my spring closet cleanse and the benefits therein. Usually I "turn my closet," as my friend Margaret says, make my lists, send some stuff to the consignment store or to a charity shop, go shopping... and then sit back. Satisfied that I'm organized, and ready for the new season, sartorially speaking. But when Chris asked, in a comment on that post, how I thought a "curated closet" might look. And then Patricia recommended a book by the same name. I started thinking. About what the term "curated closet" might mean. According to the Oxford on-line dictionary the act of curating includes "selecting, organizing, and looking after" whatever is in question... like art, books, or even clothes, I guess. And it can also include "presenting" that collection using "professional or expert knowledge." Okay. I select, I definitely organize, and I've always "looked after," my clothes. My sisters and I learned early from our mum, no playing in our good clothes (including school clothes.) So now I still change out of good sweaters, suits, and even jeans whenever I come home. Like making the bed, it's just one of those learned-early habits that stick. "Looking after" also includes proper hand-washing or dry cleaning, if necessary. And if you take off your good clothes and don't cook or sit around in them, you don't have to wash your nice blouses, sweaters, or pants every time you wear them. I remember a heated discussion about this one day at work before I retired. Some of the younger members of staff were aghast that I didn't throw everything I wore every day in the wash. And I was aghast that they didn't wash wool sweaters by hand in cold water, or dry clean good jackets once a season. Generation gap, do you think? But, I'm digressing, as usual. Last week I decided that I would write about, i.e. "present," my "curated" wardrobe, with which I am eminently familiar, hence an "expert." 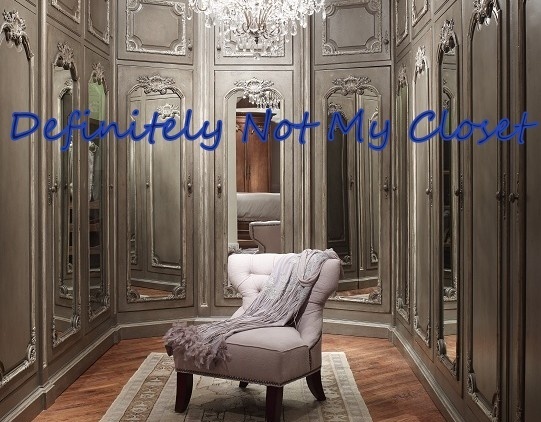 After I read Chris' comment, I started looking at "curated closets" in various articles and blogs. I checked out the book and the blog that Patricia mentioned. As she says, The Curated Closet by Anuschka Rees won't be published until this fall. So in the meantime, I visited the writer's blog Into Mind. There is a ton of info there... a ton. Maybe a bit too much. I think that Anuschka over complicates things. And that's saying a lot coming from someone who keeps lists like I do. I also read about "capsule wardrobes." I like Rachel the Hat's approach; you can read about Rachel's "capsule wardrobe" here. Rachel was inspired by Caroline's blog Unfancy, which is all about creating a capsule wardrobe. Lots of good stuff here, I think. Caroline has great ideas, even if I don't agree with them all. So how, I asked myself, do I turn my very tiny, fairly minimal, pretty well organized closet into a "curated closet?" Or even a "capsule wardrobe?" And what's the difference between the two? I already have a plan for each season. I try everything on. I weed out things that don't fit, or which I know I'll never wear again. Like my lovely corduroy Laura Ashley dress which I owned years ago and which still fit, but suddenly... kind of didn't go with my face anymore. I had, as Lisa said in a post about shorts, "aged out" of my Laura Ashley dress. I sort into three piles: wear (love, still fits, in good condition), store (won't wear this season but may sometime in the future), and jettison (hate, doesn't fit, not in good condition.) Then I re-sort the jettison pile into consign, give away, or toss sub-piles. Then I put away the keepers and make a shopping list. So does that make my closet "curated" or "capsulized?" First off... I store things I know I won't wear this season. That doesn't fit with my understanding of a capsule wardrobe, but I think it is an important part of what a "curated closet" should be. I don't box them and put them in the garage, then get rid of them if I haven't worn them by the the end of the season, as recommended on Caroline's blog. If I buy a good jacket or a suit, I do so because it's timeless, and well made, an "investment piece." And I know if it goes out of style one year, it will be back in the not too distant future. Like a green tweed Max Mara jacket that I bought in 1998 and which I started wearing again last fall. Or my blue Max Mara spring suit which I hauled out of the closet in April for the first time in years. I'm particular about what I store, and I store them carefully. No way I'm cramming a good jacket into a box in the garage. Even if we had a garage, which we don't. And I'm not going to limit myself to an arbitrary number of items, like most definitions of a "capsule wardrobe." That just seems silly to me. And since it's my closet, I get to make the rules. So here's what I'm doing to turn my closet from pretty organized, into my definition of "curated." Before I made my trips to the consignment shop, and the charity shop, I had another, rather more severe, look at the items in my closet that had made the first cut. If I was going to keep them then I had darned well better start wearing them. I identified the pieces that hadn't been worn as much as they should. Two skirts, two long-sleeved tops, two summery tops, a sweater, and two jackets. I love them all. But if they were going to take up space in my tiny closet, they needed to get out more. And I thought that writing this blog post would give me the perfect opportunity to see how, and if, I wanted to wear them anytime soon. I bought this light, long-sleeved Alexander Wang tee last winter and have hardly worn it. Maybe spring is more suited to its weight. So I paired it with my white, cropped NYDJ jeans, and my sneakers and I really like this combination. Then I added my Paige jean jacket, and even a light scarf, since we've had some pretty cool spring days lately. I love this look; I'm a sucker for navy and white. Next up was this cream silk blouse from Rag and Bone. It's really light, so works best on a hot summer day or evening. I thought it might work with these black, crepe joggers from Aritzia. I love these pants. But most days I find myself reaching for my leggings instead. No more. And, I thought... if I have another ready-made outfit with these joggers and two of my very favourite pieces. This breton striped tee that I took to France last year. Guess it was a bit like coals to Newcastle, wearing this on our France trip, eh? And my Twiggy jacket, which has had no problem getting out of the closet... at all. Then, maybe I'll get more wear out of my joggers. So I have a spring and a summer plan to wear these pants. No excuses, now. I'm not finished playing around with my "keepers." I'll be figuring out how I can get more wear out of the other pieces in the next few weeks. But there were a couple of items that made the initial cut, which didn't make the second cut. I tried various combinations and had to admit that they really belonged in the consignment pile. And that's where they are now. At Fiona's store. Where I hope they find a new home. I made one last revision before I was finished. I had a few items, like this Elie Tahari dress and pencil skirt, that still fit, I still loved, but which I couldn't see myself wearing on an everyday basis. At least not in my current, very casual, everyday life. But what if I needed a day dress or a skirt that was a bit more business-y, a bit less casual than, say, my denim skirt? I thought about my Lida Baday party dress which I haven't worn in two years, but I keep because you never know when you might need a black party dress. Might it be better to store this dress and skirt, just in case? So I did. I decided that a well "curated" wardrobe should include a few "just in case" pieces. And I added to that category a pair of black Theory summer dress pants, and a short Burberry wrap-around skirt that is good for beach holidays. These pieces are together in a garment bag in my storage closet (aka Hubby's closet.) Now that I've designated them as "just in case," I don't feel guilty that I'm not wearing them on a day to day basis. They're doing what they've been designated to do, for the moment, anyway. Clothes also serve which only hang and wait... for the right occasion. Right? Sometimes, though, the upside of buying "investment pieces" (they're timeless and they never wear out) can also be the downside. A couple of my tops or jackets that don't get out much may, in the end, be because I'm just right royally sick to death of them. And if that's the case, after a while, I'll stick them in my storage closet and reassess them next spring. So to sum up, I divided my already edited closet into a few new categories. I've identified a few pieces that need to earn their keep. And I'm making an effort to wear them more. I've also stored a few of my "keeper" items in case of a specific need, pieces that I would probably not wear on an everyday basis. I'll let you know how I get on with the rest of my "keeper" outfits. And whether those pieces I've identified as being at risk fall off the list. Or not. Total of 40 day to day pieces which hang in my closet + 4 "in case" pieces which are stored. That sounds like a lot, doesn't it? But some of these items I wear year round. My denim jacket for one. Or my white and blue cotton shirts. Or jeans. What's important, I think, is that I know what's in my closet. And I know what works with what. And that's the beauty of a "curated" closet. So what's in your "curated" closet? Have you ever crunched the numbers? Care to share your final break-down with the rest of us? Linking up this week with these great blogs: Visible Monday at Not Dead Yet Style, #IwillwearwhatIlike at Not Dressed as Lamb, All About You at Mama and More, What I Wore at The Pleated Poppy, Thursday Favourite Things at Katherine's Corner, Passion 4 Fashion at Rachel the Hat, Fun Fashion Friday at Fashion Should Be Fun, and Friday Finds at Forage Fashion. I'm similar. I cannot relax at home if I'm in my work or going out clothes. Like you I don't wash them each wear either. My daughters, however much I told them, don't follow the same rules and then moan that they having nothing to wear. I also store classics. Just dug out a Gucci cross body bag I had in the 80s for instance. I like your explanation of a curated wardrobe. I think that's what I have. Capsules do not suit me. I keep too much, just in case. Capsules are too arbitrary for me. I guess the idea of their "rules" is a gimmick to get people to be organized. Or to sell books? Maybe? Great post. I have recently done the same thing, using Marie Kondo's book as a guideline. I also have a few "just in case" pieces as well as a few "I just can't make a decision now" pieces. I don't know the numbers, but it has been significantly reduced and the charity store got a real haul! I too have a few "not quite ready to get rid of" items. And then there is a small garment bag of classics, that I know I'll wear again one day. Thanks for weighing in, Laura. What a creative and mindful solution to my question about a curated closet! You took closet organizing theme to the deeper level that's so challenging. I like your concept of pieces 'earning space.' Thank you for your blog and savvy style! Hi Sue ...crunch the numbers, now that's a thought. Not sure I'm brave enough to do it!! I really do need to "let go" emotionally and physically of certain things in my wardrobe. I confess to having quite a large space for storage but on reflection I think maybe a smaller wardrobe encourages regular organisation ie on the one in, one out principle. Like you, I take good care of my clothes and change when I come home. I vividly remember my son who was at Uni at the time arguing with his sister about sorting clothes into separate washing loads. She was like, " no, you don't have to do it like mum does it, you can just throw everything in together!! " I was quite proud of him, really. Not sure he's still so careful. However, he did introduce me to "colour catchers" which means I no longer worry about colour mixing when washing. Thanks for including links to articles and blogs you used as research on this post I ll definitely have a look at them ... I need all the help I can get! Also, I've found that travelling for longer periods of time has resulted in the purchase of extra items such as shirts, t shirts and white jeans. We tend to be on the move every couple of days with no access to washing machines or time to dry tops etc in a hotel bathroom. Mind you, that doesn't justify my handbag collection!! and no, I don't take lots of handbags on holiday! Just a backpack, cross body bag and a small one for evenings! :). All three will fit inside each other. Thanks again, for another great post Sue. My small closet is a good motivator...otherwise things are all crammed in and have to be ironed with every wear..which is also a good motivator. Love the "nesting handbag" idea. Good way to store bags too, I think. I remember a friend in high school used to do that... until one day she came home from school and found every single thing she owned from her closet and two chests of drawers, dumped in the middle of her room. Her mum's revenge. By the way..that silk Elie Tahari dress is currently at Fiona's store Frock Exchange... http://www.thefrockexchange.ca/. It's been listed at under $100.00 which is a steal. So if you're anywhere near Kanata, Ontario....you might want to check it out. Just sayin'. Oops. Sorry Jenn. The dress that's at Fiona's store is a v-neck, silk Elie Tahari dress. Above the knee. Still lovely. Just a bit short for me now. The giraffe-print one is still in my closet. This was a very interesting post. I, however, am nowhere near being able to start cutting my closet down yet. I am still in a hoarding mode and feel like I have a special relationship with every single piece in my closet! Oh, I know I have way too much, but I'm just not ready to part with any of it yet. Perhaps, I will get there someday. But I really enjoyed reading this! I admire your system - mine is more ....erratic . Have you ever had regrets about any items you've rejected ? Always a problem for me . I recently dreamt we visited you & I forgot all my clothes , had to share hubbies ! Truly a nightmare , still feel the embarrassment . You always look great . I haven't had any regrets with getting rid of things. Maybe a few pieces of my fall business wear that I gave to my young teacher friends...some of that, I know will be really in style this year. But I'd still never wear it. And I try to think how great it is for them to have an outfit they probably couldn't afford what with their mortgages and young families. I always take those 'capsule wardrobe' articles with a grain of salt. Your concept of a curated wardrobe makes more sense to me. Think about the items that are kept, put together outfits and remove orphan pieces. Don't get rid of investment special occasion wear. As I approach retirement I am looking forward to getting rid of much of my work wardrobe, the less exciting items if you will. Like dress shirts, multiple black pants, shoes with heels, skirts etc. I too was taught that you change out of your school/work outfit when you get home. I'm curious though - do you get a lot of wear from your good clothes now that you're retired? You've got some great outfits. Do you change every time you go to the store for some milk? would you change into a special hiking outfit to go for a walk? I find I'm tempted to run out on an errand in my 'home' clothes sometimes, sheer laziness on my part! I gave many of my good work outfits away in the last two years. To friends that I worked with and who are much younger than me. Some I sold. So I have quite a minimal "good" wardrobe. But I still never wear my "good" jeans or tees around the house. I am a messy cook, and ruin everything with spots of oil or tomato sauce. Somehow a big apron is never big enough. So I change every time I leave the house... just into jeans and a tee, usually to run to the library or store. I don't have real hiking/walking gear...mostly because I wear yoga pants or sweat pants around the house...these do double duty for walking. I do have cycling gear though. I have been working at putting together a cohesive wardrobe that suits my retired lifestyle (not quite as organized as you though) but have real doubts about those minimal/capsule etc wardrobes espoused around the internet. I like a little bit of pizazz in my wardrobe so need some fun stuff as well. As I can sew these items it doesn't have to cost megabucks. I also have good clothes that I have had for years, that are still wearable but not necessarily everyday (a crushed silk sheath dress is not going to work to run out for that pint of milk!!!) but occasionally I have a need and dive into this part of my closet. Like others I still change out of my good clothes to cook etc. Once again you have, for me, hit the nail on the head with this post. Thanks for the inspiration as always and the great styling ideas. Me too...I have major doubts about all those "capsule" wardrobes, "essential" wardrobes. No woman's closet ever looked that neat and... minimal. Lovely.. but not believable to me. Thanks, Patti. As always, thanks for hosting. Great post. I have far too many clothes of all varieties but I can't bear to throw away anything, even the ones that don't fit because they are all still in good condition and wearable. But I don't wear most of them! You inspire me to just do it because it's beginning to get to me that every drawer, wardrobe and cupboard is overfull and just a bit of a mess. Like you I always change when I come home.I assume your "in house" clothes are not on the list so how much do you have not listed for wearing in the garden or slouching around at home? There is a new Twiggy jacket in Marks and Spencer now http://www.marksandspencer.com/textured-biker-jacket-with-wool/p/p22405619?prevPage=plp Navy Textured Biker Jacket with Wool if you fancy another. I live in Scotland, UK and like the Twiggy range at M and S.
You're right...the stuff I wear around the house is not on the closet list. It's in a drawer... sweat shirts, yoga pants, tee shirts, a zippered hoodie or two. And I have a couple of pairs of old sweats and tee shirts that I only wear when we're camping. I must have a look at that M&S jacket. Thanks. I love the term curated....but (as you know from my shoe post), I'm not very minimalist. But I am very organized and I do love to purge (I just also love to replenish!!). My husband & I still change clothes when we get home usually---into sweats. My mom did it with a lounge outfit and even grandma did it with her housecoat! It does save on the washing & dry cleaning which is hard on clothing!! I do like the joggers, but I especially like them dressed up (like with your silk blouse)---then they seem better than sweats!! I love those joggers. They're not made of fleece, but of crepe, and have pin tuck pleats in front so they look like real pants, except with an elastic in back and cuffs. Great post! I also really like the idea of becoming the curator of my wardrobe. Definitely a work in progress. Thanks, Beth. Mine is a work in progress, too. I really like the phrase "curated closet". It sounds ever so much more elegant than "organized". Inspiring post! Thanks. Doesn't it? There are so many "new" organizational buzz words these days, aren't there? You always have such classy sophisticated looks, Susan! Thanks so much for being a part of Fun Fashion Friday! Thanks for hosting Dawn Lucy... as always. I always enjoy your looks and I like your tips for a curated closet! Thanks for sharing with Thursday Favorite Things! Thanks, Angelina. And thanks for hosting. Good advice as per usual, Susan. I attack my wardrobe ( or at least try to ) every six to twelve months and have become increasingly ruthless each time. It's usually Tees, shirts, polo/turtlenecks ( at any one time I own around twenty of the beggars ), heavier sweaters, jeans that have gone out of style and slacks that get thinned out. Thanks, Cee. I must admit to socking away jeans that still fit but which have gone out of style. For a time anyway. Thanks so much for joining in our My Refined Style link up fun!